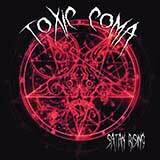 The ultimate unheard of cult band, Toxic Coma is a project from Velvet Acid Christ mastermind Bryan Erickson. Unlike the more structured approach to VAC, Toxic Coma allows for a more experimental, fun, psychedelic, and downright weird approach to industrial techno music, allowing the band to use noises and samples that wouldn't work for VAC. Dance oriented and trippy as hell, Satan Rising does display the influence of bands like The Prodigy, Astral Projection, Front 242, Aphex Twin and Skinny Puppy in a unique manner.